A still lake without wind. The occasional baitfish breaks the stillness, and bass burst from the water. 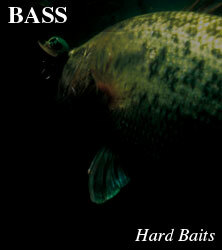 It’s obvious that the bass are watching the surface; however poppers and pencil baits are just not working. In high season when there is no wind and bass are being selective about the baitfish they chase, and strong lures don’t seem to work, the best lure to turn the bass on is "Laydown Minnow Wake". The aim was to make a lure with a rolling action, and displaces water to create waves across the surface. High flotation body and lip balance keeps the lure right on the top of the water, to make an enticing wake pattern. On top of this the rolling action makes the most of its flash appeal to visually stimulate following bass, and bring them to bite. Design with sound in mind, typically used on high pressure lakes "REGULAR" and "JUST WAKASAGI" models are silent. While "110" model that is usually used on big lakes and in muddy water is fitted with low tone single shot rattles. The "110 PROP" model is a standard "110" fitted with a metal prop to attract even in slightly rough conditions. For nervous bass, were typically strong top water lures cause the fish to turn away on the stop, LAYDOWN MINNOW WAKE’s continuous fine vibrations entice them to attack.